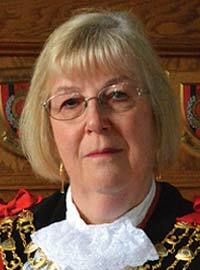 Councillor Gill Mattock arrived in Eastbourne in 1971 to attend teacher training college and married Alan three years later, acquiring three stepsons. Paul was born in 1977, and she now has eleven grandchildren and four great grandchildren. Gill had a long career in teaching before she retired in 2012. She started as a primary teacher, with French as her main subject, then went on to work in prison education, where she learned as much from her students as they did from her! She later worked at Sussex Downs College in the basic skills department finishing off her career at Sussex Coast College in Hastings as a teacher trainer. Elected to the Council in May 2007, Gill has been in charge of the Council’s purse strings for the last 10 years. She also sat on the joint waste committee and has learned more about dustbins and rubbish that she ever imagined. Gill was responsible for the introduction of the Council’s first income generation project, Solarbourne. Gill is a keen rambler and represents Eastbourne Borough Council on the South Downs National Park Board. She instigated the Eastbourne Walking Festival, now in its fifth year. She is a volunteer at Bodiam Castle, where visitors can enjoy a guided tour with her in medieval washerwoman costume. She loves reading, particularly historical fiction, and her friends and family report she is an excellent cook: her curries and soup kitchens are legendary. She continues to speak (very rusty) French, and regularly visits the country on holiday. Gill is looking forward to serving her town as Mayor, and raising funds for her two chosen charities, Memory Lane and Wayfinder Woman. As her Mayoral year coincides with the 100th anniversary of Women’s Suffrage, she has chosen “Inspirational Women” as its theme. Please note, the Mayor eats chicken and fish, but no red meat, and is allergic to pasta.